Just two months after its launch, Beijing-based bike-sharing company Ofo has canceled its pilot program at the Weizmann Institute of Science, a research university in Rehovot, a town in central Israel, Yedioth Ahronoth reported Tuesday. According to the report, the main reason for canceling the pilot, which was planned for a four-month period, is the high cost of retrieving bikes that were taken out of campus or locked with personal locks to prevent other people from using them. 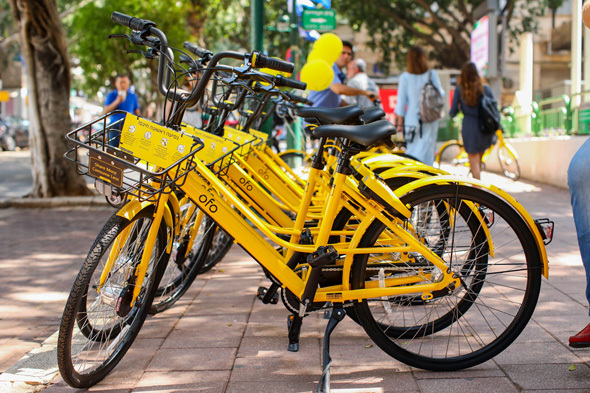 Ofo also operates pilot programs in Ramat Gan, a city on the outskirts of Tel Aviv. Unlike similar services operating in Israel, Ofo does not require users to park bikes at specified docking stations, and users locate and unlock the bike using a mobile app. Calcalist first reported Ofo's intention to enter the Israeli market in July. In July, Ofo raised $700 million in a funding round led by Alibaba. In April, another Chinese bike-sharing company, Beijing Mobike Technology Co. Ltd., announced the launch of a free pilot program on the Tel Aviv University Campus.